Hopkins is planning to invigorate its performing arts program with the construction of a new arts center that would be located at the site of Lovell Hall. After an attempt to improve Hopkins’ performing arts program failed due to lack of funding nearly 30 years ago, the school’s administration has, once again, identified the performing arts program as a department that is not well-served by its facilities. Several years ago,during a master planning process, the project was revived as a school priority. 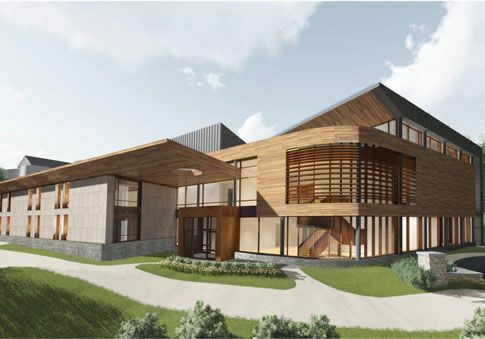 This spring, the Board established a committee made up of trustees, members of the Performing Arts faculty, an architect, and some administrators and staff, to design a plan for the new building. “The committee started to think through what we needed in terms of space. Adding a large 350-seat theatre, well-suited for both musicals and dramatic performances, a black box, sufficient classroom and rehearsal space, larger costume, set design, and prop construction storage rooms, a better reception area, and a green room, the committee came up with a construction program with a huge price tag—it was over twice the amount for any other building on campus,” said Head of School Barbara Riley. The new arts center will represent Hopkins’ commitment to its arts program. Riley hopes that the construction of the new arts center will reinvigorate Hopkins’ performing arts program as the construction of the Malone Science Center did to the science program. “The construction of Malone was a statement to the entire community that Hopkins really cared about the sciences. Statements like this excite people and attract faculty and students to be more involved in the program. The center will clearly announce that Hopkins cares about the performing arts in a beautiful and understated way,” commented Riley. The new arts center would change the experience of entering the school from Knollwood parking lot. Mostly made with wood, glass, and granite, the new center will be di#erent from other buildings on campus that are made with bricks and embrace references to Georgian architecture. “People entering Hopkins from Knollwood would see all this light, glass, and wood—the building would drastically change that side of the campus,” said Riley. While the Board has approved the design and the committee’s plan to use some of the existing steel foundation of Lovell and compress space by devoting less space to hallways helped reduce the cost dramatically, many things must happen before construction can happen. “The price is under 25 million dollars right now, and figuring out how to raise the money is the step we’re at right now. The Development Office and Committee of Trustees are going to try their best to reach out to the support we have. The fundraising phase is really di%cult—sometimes it happens really fast and sometimes it takes a long time. I want to remind everybody that we still need a lot of work to do before bulldozers come on,” said Riley. Regarding the prioritization of construction projects, Riley recognized the desire for additional projects and di#erentiated between the types of campus construction. “Fixing the grass situation on the Smilow Field and possibly funding for a turf field, for example, would come out of the school’s reserve fund because it’s fixing a field. Funding for a turf field or a track would require about a million dollars each and would not be in competition with a project such as the construction of a new arts center. Two things that would be in competition would be building a field house for athletics or adding onto the Alumni Office so we could move the Business Office over there and relieve the crowding at Hopkins House,” said Riley.